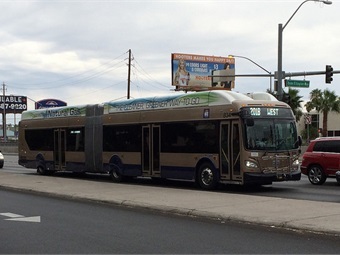 LAS VEGAS — The Las Vegas Review-Journal reports that 15 people were injured, one critically, when a man driving a truck ran a red light and crashed into a Regional Transportation Commission of Southern Nevada (RTC) bus that was almost through the intersection. One truck passenger, a woman who wasn’t wearing a seat belt, is in critical condition with life-threatening injuries, while the driver and the other occupants of the truck were also hospitalized with nonlife-threatening injuries, including broken legs. Ten bus passengers also were sent to hospitals, but their injuries were minor or nonlife-threatening. The bus had an onboard camera, and police will examine the video as part of their investigation said. For the full story, click here.